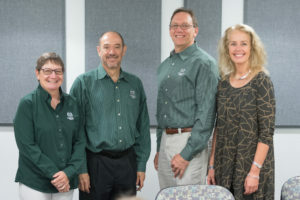 With Colorado State University’s research expenditures reaching a record of nearly $375 million for fiscal year 2018 – one-third of the institution’s overall annual billion-dollar budget – the University is poised to continue its high-level research mission. While grants from both public and private sources allow faculty and researchers to explore important scientific questions and make cutting-edge discoveries, each one comes with its own set of specific reporting rules and regulations. This is where the small platoon of CSU’s research administrators comes in, to make sure we do research right. More than 160 dedicated professionals are deployed in colleges, units, departments and labs across campus and in remote locations, all with the mission of helping investigators secure external funding, then ensuring compliance with the terms and conditions of the funding contracts once the research begins. The research administrator’s job starts in the pre-award phase with assisting faculty in the development of the administrative sections of a grant proposal, completing required government and agency forms, drafting budget justifications, interpreting guidelines, document coordination, and helping to meet deadlines. It continues through ensuring the request is submitted correctly, and, once the grant is awarded, really ramps up with negotiating the award requirements, setting up accounts and cost accounting so researchers can spend the funds properly, and keeping on top of all the reports required throughout the life of the grant. It can be as complicated as it sounds, especially when you add in compliance with shifting policies at the university, state and federal levels and all the different rules and regulations of all the different funding partners — one project can have multiple funding sources and potential subcontractors at other institutions, and each researcher can have multiple sponsored projects underway at once. That’s why the top characteristic that Diane Barrett, director of the Office of Sponsored Programs, looks for when hiring a new research administrator is a sense of humor. Indeed, a 2016 survey of the members of the Society of Research Administrators International found that administrators themselves ranked knowledge of rules and regulations and customer service and collegiality the most important qualities for success in the field. No one considered math and budgeting proficiency the quality of most importance. Christa Johnson, associate vice president for research, sees the role of the Office of Sponsored Programs as not only supporting the university’s overall research enterprise, but also providing research administrators the resources they need to support individual faculty in their research. When Johnson came to CSU from Washington University in 2015, one of her first initiatives was to bring the far-flung research administrators closer together, so they can share what they have learned through dealing with various funding agencies. The result was RAM (Research Administrators and Managers) Around, which meets monthly in the Morgan Library Event Hall to provide a forum for knowledge exchange as well as professional development. Ron Splittgerber, director of research services who started at CSU as a volunteer in the 1960s while he was a student at Fort Collins High School, has seen several important changes over the years: grant systems moving from paper to online, for example, as well as the professionalization of the research administrator role, and the growing appreciation of their importance to the success of the university’s research enterprise.